City dwellers may winge about the cooler weather but those in the Victorian ski fields are embracing the cold snap. Residents and visitors to Mt Buller are no doubt delighted with the recent snow dump ahead of a brand new event set to take place on July 28-29; the Mt Buller Sled Dog Quest. Held over two action-packed days, the event will see sled dog teams from across Australia compete two challenging courses: a shorter course for two and four dog teams, and a longer course designed for six and eight dog teams. Up to 30 teams are expected to compete in the Sled Dog Quest Event at Mt Buller, beginning at twilight in the heart of the village, heading up the Bourke Street ski run and around a course that covers the ski area. The six and eight dog teams will get together on day two in the Corn Hill area as they follow along a picturesque course towards Mt Stirling. 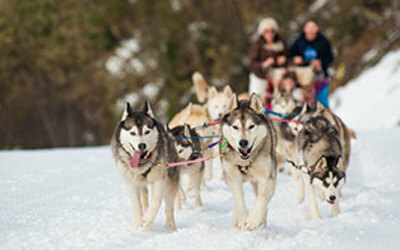 The Sled Dog Quest Event is an exciting addition to Mt Buller's snow season, offering a unique activity to visitors from Victoria and further afield. John Huber, the Chief Executive Officer for Mt Buller Mt Stirling Resort Management says. “We are very excited to welcome the Mt Buller Sled Dog Quest and all the participants to our calendar of events in 2015. The race will offer a fun and diverse experience for competitors and spectators alike"
The Seld Dog Quest Event is held in conjunction with Australian Sleddog Tours; the organisation that offers a range of sled dog tours that take in some of the breathtaking alpine scenery and magnificent views of Mt Buller Village. Dog led tours include meet and greet sessions with the beautiful canine tour guide group in all of their husky glory, with plenty of photo opportunities offered during the tour.